This the first part of the story, about the first week of the trip. Part 2 will cover summit day and Part 3 will add some practical advice and considerations. I’d booked with Jagged Globe last summer, once some of the job stuff had settled out and had been training for the climb for a few months. As ever not quite enough, but more than I had my Nepal trip. JG do a pre-trip meeting, so I’d travelled up to their offices in Sheffield a couple of weeks before the trip. All but 3 of the group also made the trip; we sat through some talks about the trip, about altitude sickness and about kit, before doing a couple of walks, one in Sheffield, one out in the Peaks. An excellent idea, allowing the team to meet before the trip and get to know each other in a low stress environment. An early start to the day, with a 0630 flight from Heathrow. I’d gone out the night before, to avoid having an early taxi – and I’d taken the opportunity to get an upgrade to the flight, as a treat for myself. Not all the group were at Heathrow – many were starting from their local airports and we met up in Amsterdam, where we also met Jamie, our guide, for the first time. I say we met up – bad weather in Amsterdam meant that there were flight delays and one of the groups did not arrive in time. They got to Amsterdam too late and had to stay 24 hours. 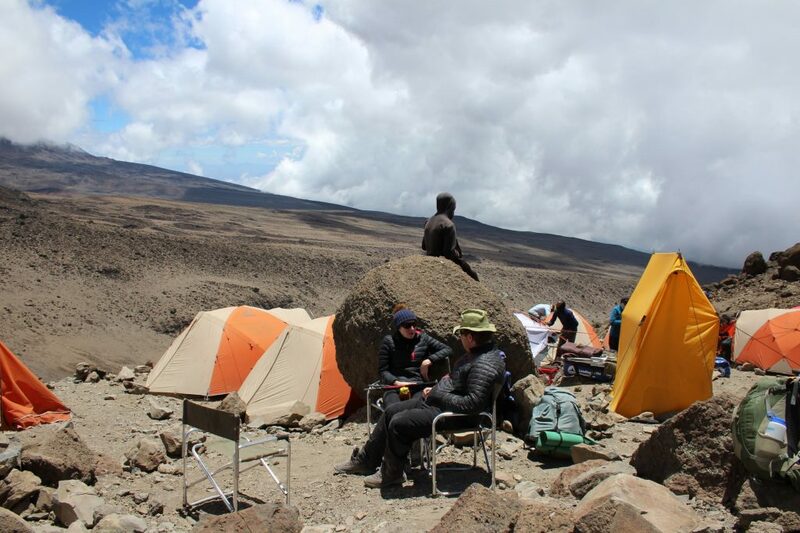 There was some discussion whether or not they would join us, but they ended up taking a slightly shorter day one trip and met us at a second camp. They’d have one less day to acclimatise, but luckily it did not matter. 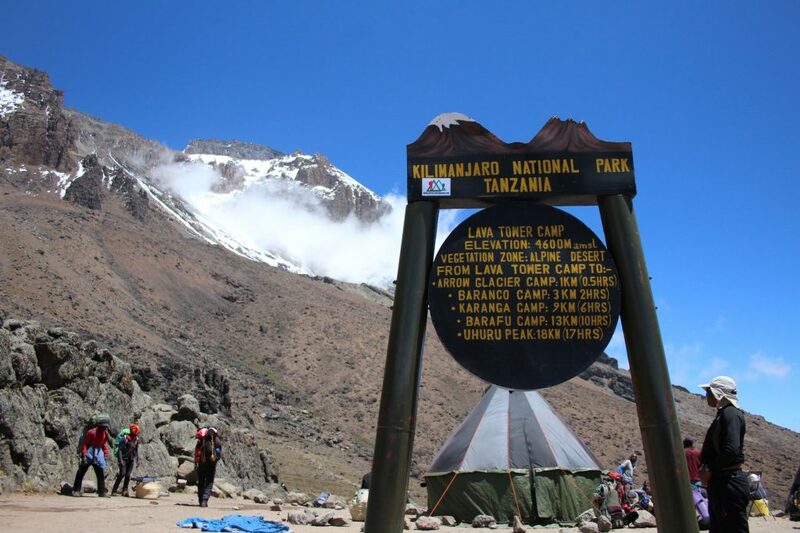 A reasonable flight to Kilimanjaro Airport, with KLM. Getting through immigration took a long time though. Not all the team had got visas in advance – nor had they got cash to pay for them so there was quite a wait to get things sorted. I was first through and started to gather all the bags, but total wait from start to finish was about 2 hours. I’d definitely advise you to get a visa in advance if you can, otherwise have the right amount of cash (dollars) available. A hour’s journey by road to the hotel, some food and drink and we were finally in bed for about 1am – once I’d sorted out the mosquito net!! A planned early start, with breakfast for 0730. The intent was to leave for 9, but we were about 40mins late once all the admin had been done. The road trip this time was about 3 hours, as we drove to the other side of the mountain for the sign in point at Londorosi Gate (2250m). Once there, lots of waiting. We had to sign in, then wait for the porters to organise themselves, split the gear and get weighed in. 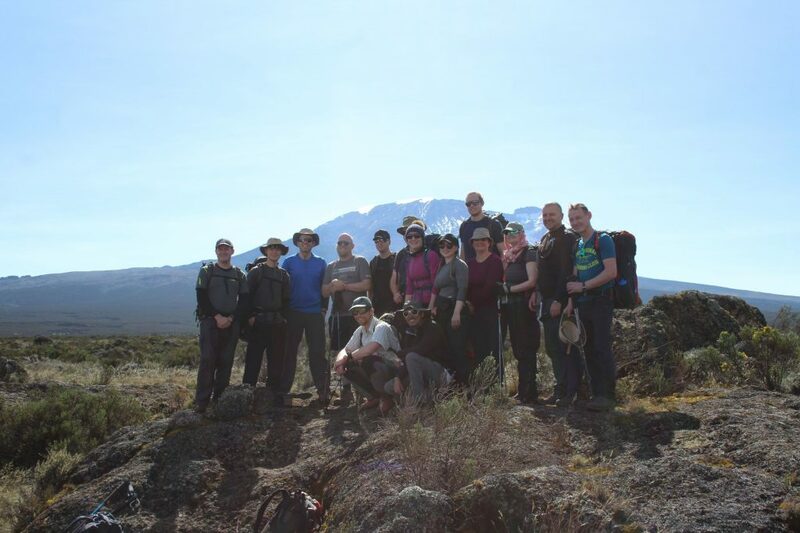 For a group of 14 trekkers, we had 1 UK guide, 6 local guides and 46 porters. Yes, a LOT. Unlike Nepal, there is no infrastructure of tea houses and everything has to be carried with the team. So that’s tents for everyone; gear; mess, cook and toilet tents; cooking equipment; food (although we did have a re-supply of this); and all the safety gear. 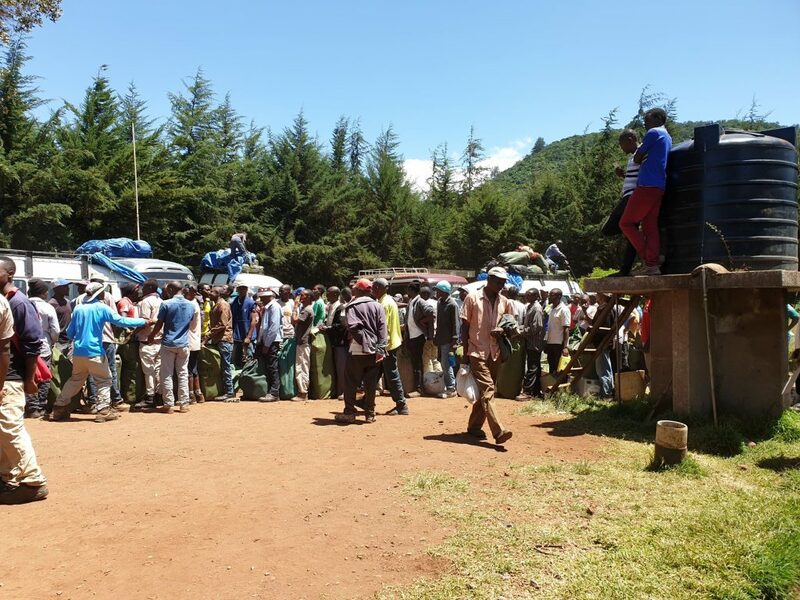 There is a weight limit which is enforced and checked as you go up the mountain, hence the need for so many people. 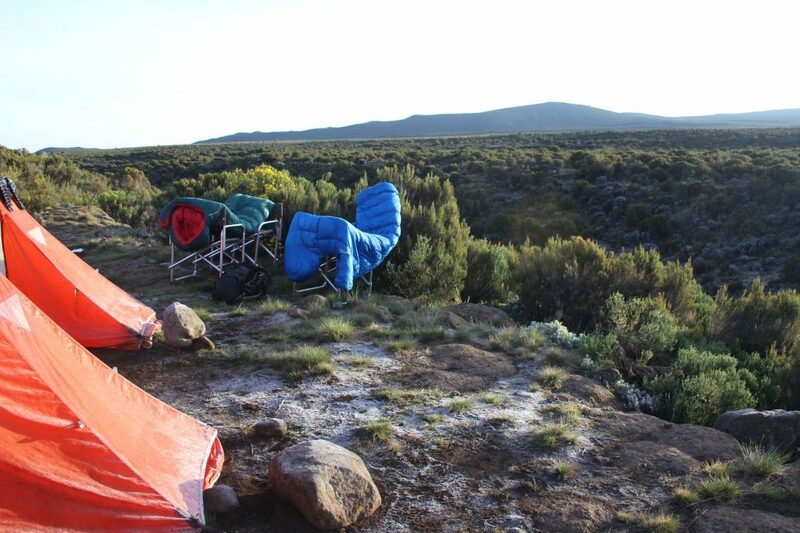 Due to the late start, we were one of the last teams to leave the check-in area – back into the van for drive to the actual start, at Lemosho Gates (2100m) , another 30 mins. 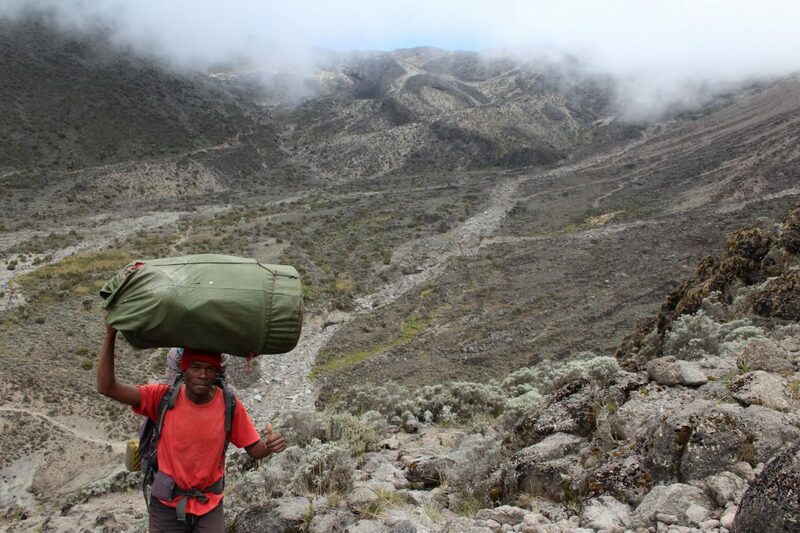 Here, the porters’ loads had to be weighed again before being let onto the mountain. We slowly followed them, a 2 hour or so trek through rainforest. 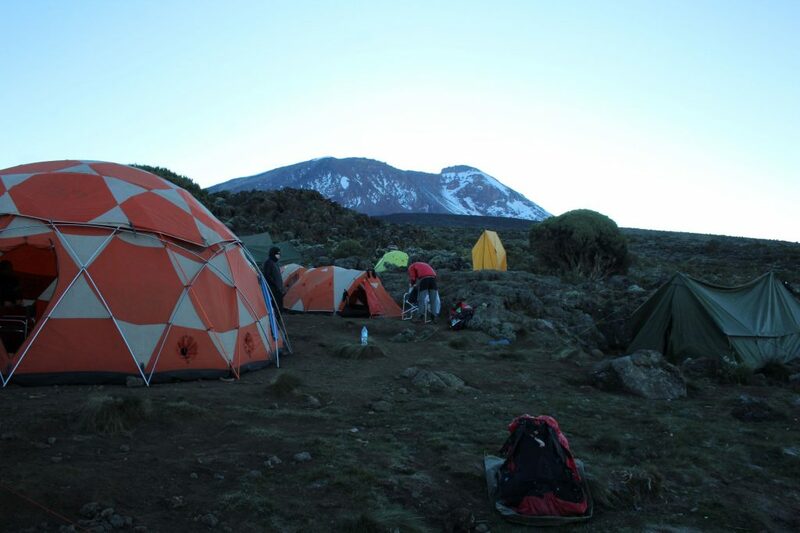 The last uphill led us out onto Mti Mkubwa, or Big Tree Camp (2650m), where the team had not yet got themselves sorted, with the final tents being put up in the dark. It was a very cramped camp, in amongst trees, with tents overlapping at times. You could tell that not everything was working well, as the vegetarians had not been catered for either, but first day complications soon got sorted out and the rest of the camp sets ups and cooking went well. A meal of cucumber soup and spaghetti bolognaise set the tone for the meals – soup, starch/sauce, followed by fruit usually. As usual on trips like this, not the best of nights, especially as my airbed developed a leak that we could not fix in the trip, but enough sleep was eventually obtained. Today was a little longer, starting off in montaine forest and heading up through scrub to “moorland” as the sign at the next camp said. We’d still not seen the mountain (it was behind clouds on our first day) but by the end of the day had still only had tiny glimpses. We started to hit some proper uphill in this stretch, and the introduction of “pole pole” ie slowly slowly. Although it wasn’t as slow as some liked, the group starting to break up into smaller groups. With the number of guides available, this was not a problem. In general, we managed to stick together over the days, but some days were harder than others. For some it was the uphills. For me, the downhills were when I got split off, especially with lack of depth perception and the need to check steps down for distance. We had our first documentable incident today, a near miss. Not far out of camp we caught our first glimpse of local wildlife, a bunch of monkeys. As we stopped to watch, another, either accidentally or on purpose, decided we were under there tree and suddenly a large chunk of branch came crashing down. luckily it missed us all, but could have done quite a bit of damage if we’d been under it. Out of the forest, into more scrubland, the growth getting shorter and shorter. We got to the campsite at Shira 1 (3610m) at around 2, in time for tea and lunch, before resting for the rest of the afternoon, mainly indoors. It had started raining around noon and carried on for most of the rest of the day. A pattern was set for the weather, clear in the morning, clouding over in the afternoon, which carried on for the next few days. Today our remaining 3 team members had arrived. They’d been driven up a different way to a trail head which meant they had less than an hour to walk. They had still had their adventures though – the Land Rover they were in finally bit the dust, and they ended up hitching a lift on top of a lorry for the last stretch! Another pattern emerged as well, the early nights. The routine tended to be dinner around 1930, then in the tent for abut 2030, read for a bit and then sleep. Although then the sleeping pattern tended to be sleep through to 1 and then doze for rest of the night. Not the best, but it was generally OK. 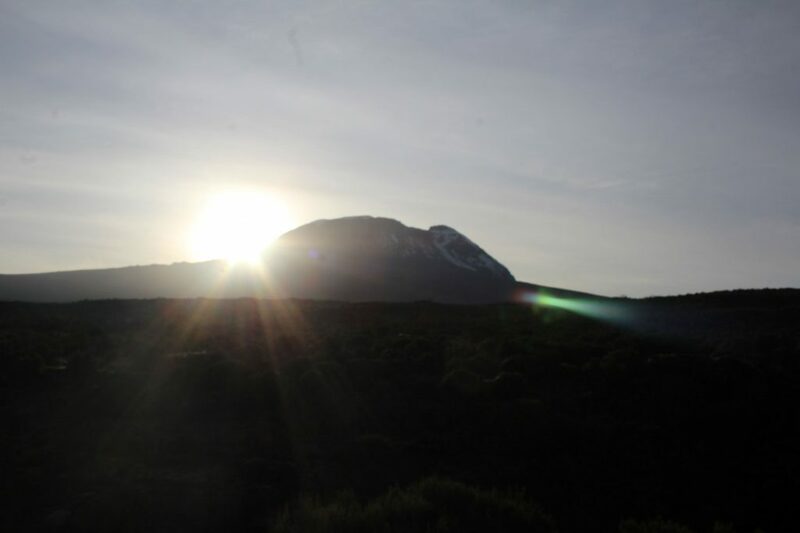 Awake at 0645 and suddenly, the mountain was actually there. The skies were clear (we had a frost) and the peak now loomed in the distance. We could now see what we were facing. It was still in the distance, we had a plain to cross before we got to the real foot of the hill, but it was definitely there. 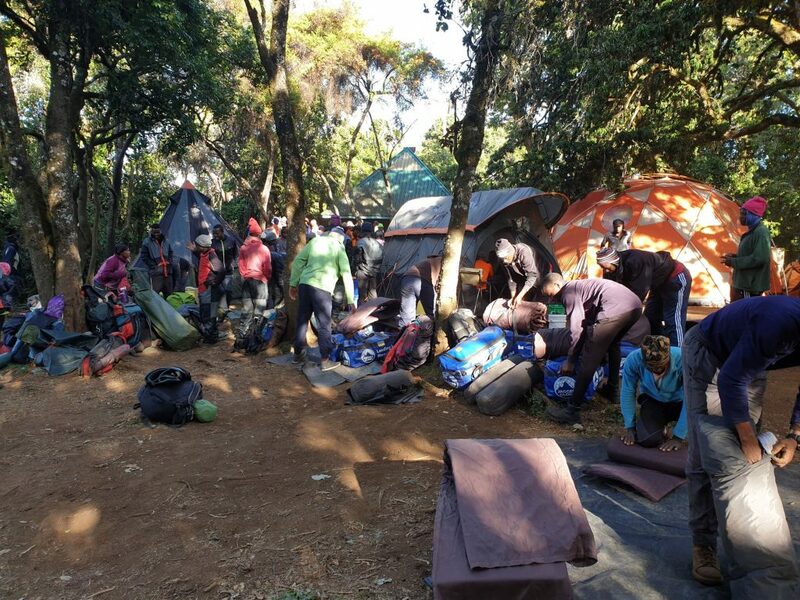 Everything gets packed up before breakfast – the porters want to start taking things down, so day pack and carried luggage needs to be ready to go. Breakfast throughout the trip always started with “porridge” – not sure it was oats, but definitely some kind of grain and probably water. Then eggs, or fruit, or pancakes. Always tea, lots of tea, usually taken with honey. Today we started to see a few health issues. Definitely headaches, and some stomach issues. One thing that is drummed into everyone was always, always use sterilising hand gel before hands go anywhere near the mouth. We had no serious issues with stomach illness, but it was more about the change of diet and routine than an infection. 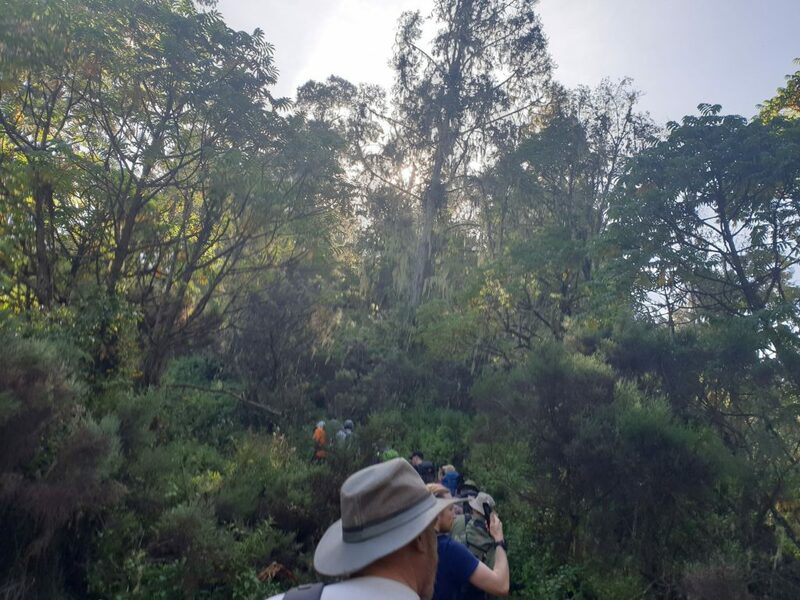 We were also provided with sterilised water throughout the trip – although I was carrying tablets, I did not need to use my own, as they made up large batches for every stop. The water is collected from the mountain – sometimes from miles away in some camps, so we often came across porter groups coming and going from collecting water. Today was another “easy” day, 4.5 hours walking but less climbing as most of it was across the plains. 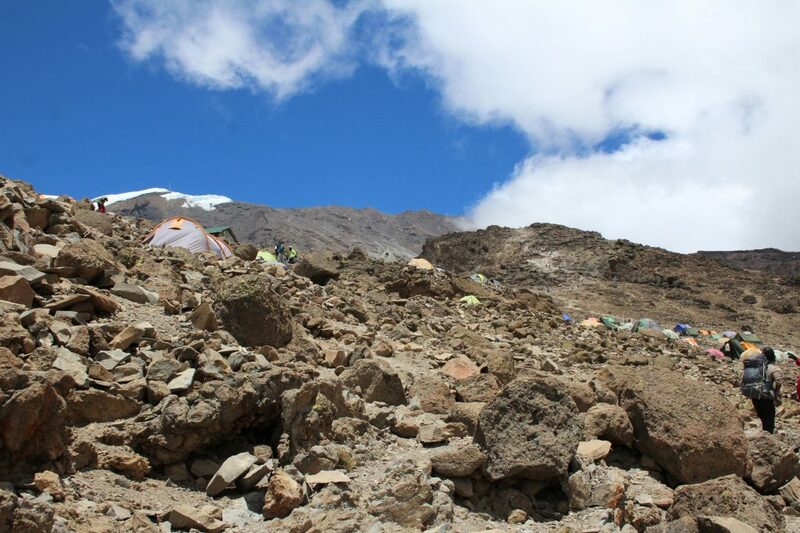 We were heading to Shira 2 camp, with a posted altitude of 3850m, only 200m or so higher than previous camp. But it’s a key 200m increase, as the vegetation gets a lot, lot less. 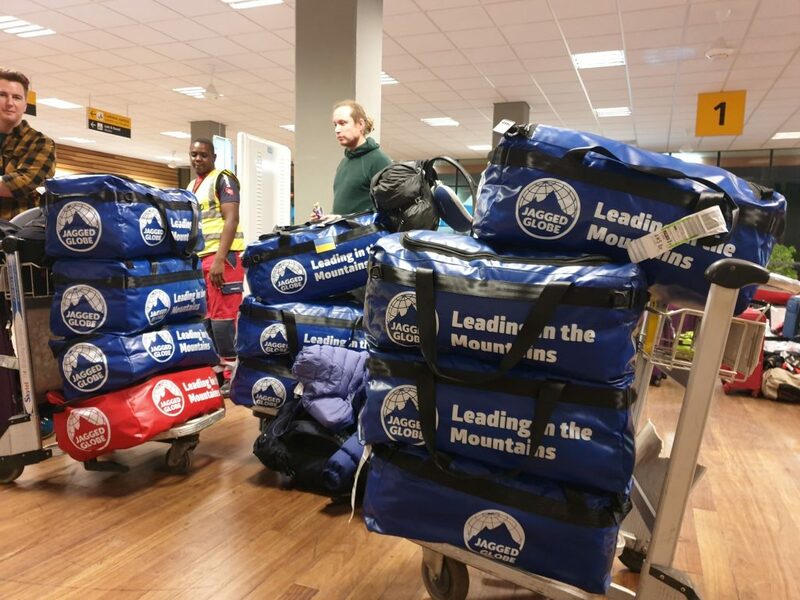 There was definitely a little bit of guilt brought out at this moment in some of the team, as things were put into the bags carried by the porters. Having 46 people carrying stuff for you is a lot to take in (in Nepal, we had only 4, as no camping kit needed). From what we had seen, the guiding company we were using locally (Keyes Hotel) do pay well for the job and Jagged Globe do provide kit. There’s a promotion route for porters. Not sure of the usual path, but each level had a specific tip requirement – the carriers, the serving team, the kitchen team, the different guide levels. I hope the toilet man was paid well! Groups all had portable toilets, put up at each stop in its own little tent. The toilet man carried this and managed it, emptying it our regularly into the camp drop toilets (which were NOT a nice environment). Our guy was excellent – and mainly invisible – keeping the facilities faultlessly clean and tidy. Today we definitely had an up and down ahead of us. 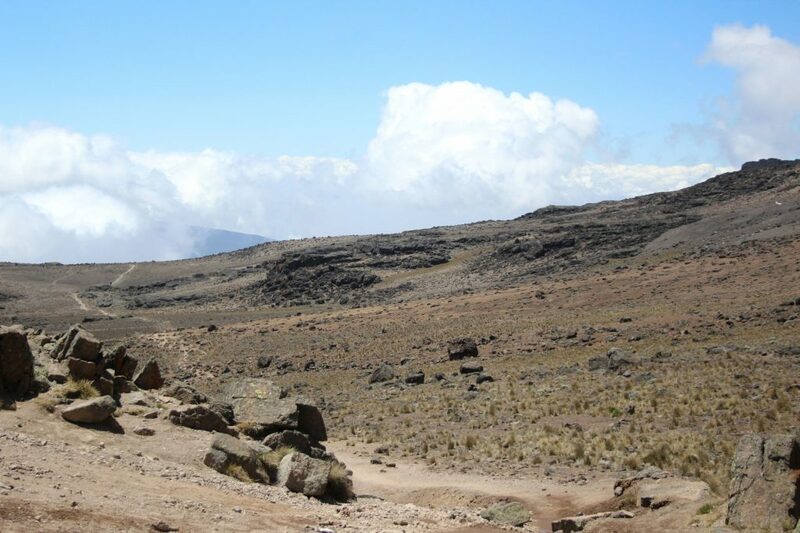 We would leave the Shira Plain and head up to Lava Tower (4600m) before heading back down to Baranco Camp (at 3900). 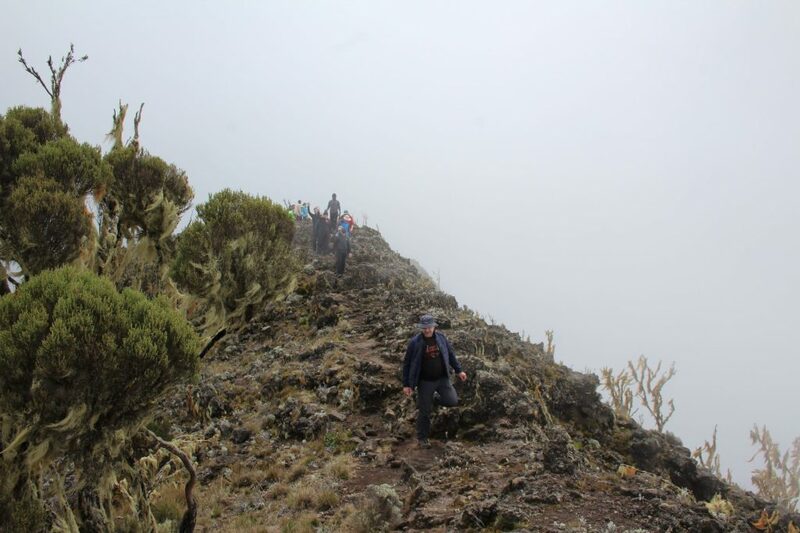 So again, little altitude gained in our overall walk, but at least the chance to get some acclimatisation in. And now we were moving less towards the mountain and more around the main cone, moving anti-clockwise around to the path to the summit. The paths were slowly getting busier as various routes combined, so groups were passing up and we were passing some groups, depending on pace and on stopping routines. Today was a packed lunch day, which we took on the way up to Lava Tower. When we got to the Tower, we saw that quite a few groups had had lunch there, with mess and toilet tents all brought up to that location. We saw this on a few days, with lunch breaks all catered, but our team either had shorter day or carried lunch with them. Going down the 700m to the next camp took quite a while. There were some quite steep bits, along with a lot of gravel and it was quite busy. The group did split up into smaller groups, although not too far, with about 5mins between the front and back. Baranco is a very large camp site and as usual, we appeared to be quite a way from the sign in point! Looking at the numbers it does not look like it should take as long as it did. Just over 5k not that much elevation gain across the walk to Karanga Camp – at 3995m not really that much higher. We’re again travelling around the mountain, not up it. Bit we did have the Baranco wall to cope with. 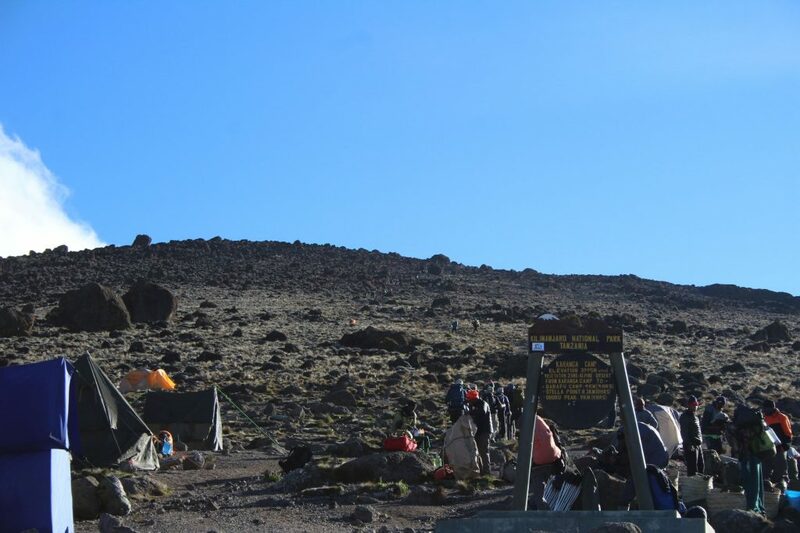 How the team approaches this seems to depend on where you are spending the evening – not everyone stops at Karanga camp, instead carrying on an extra 4k (or 4hrs or so) to Barafu Camp (at 4673m). Those teams started the climb early. Others were like us, less to do that day and so could start later. If you have the time, I’d definitely recommend taking as long as possible to do the trek. Although the profile is not brilliant and causes issues because you don’t do a lot of high/low days, the longer you can spend on the mountain is better. 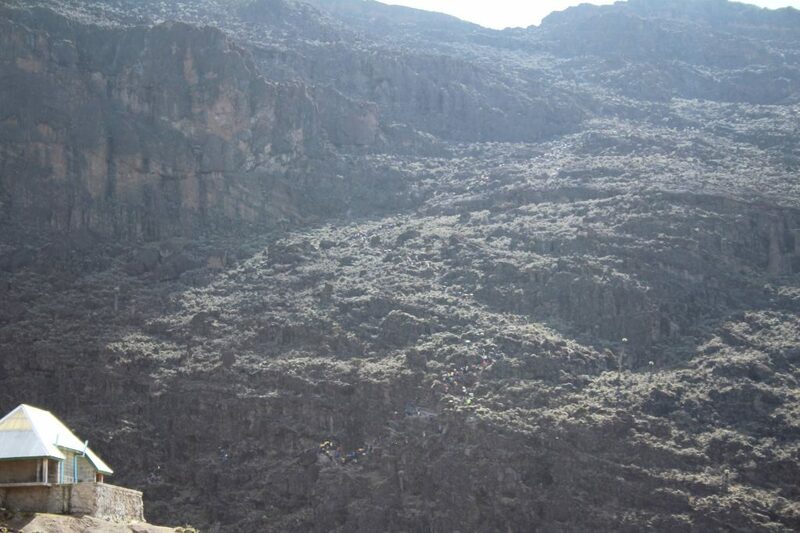 We started as late as possible…we sat and watched the trekkers tackling the wall, a snake of people. There were 2 main bottle necks we could see that cause lots of jams, it appears there was a lot of slow progress and waiting around for this part of the day. Once the lower choke point had cleared, we headed across camp to the climb, which means we had a steady walk up with no waiting in queues. The Baranco wall definitely has the most challenging terrain, a path that makes its way up a cliff space. But there’s no real climbing and only a couple of difficult scrambling points that you need to concentrate on. And the guides are excellent at making sure there are no issues at all. We all made it up with little difficulty, taking just under 2 hours for just over a mile of distance. 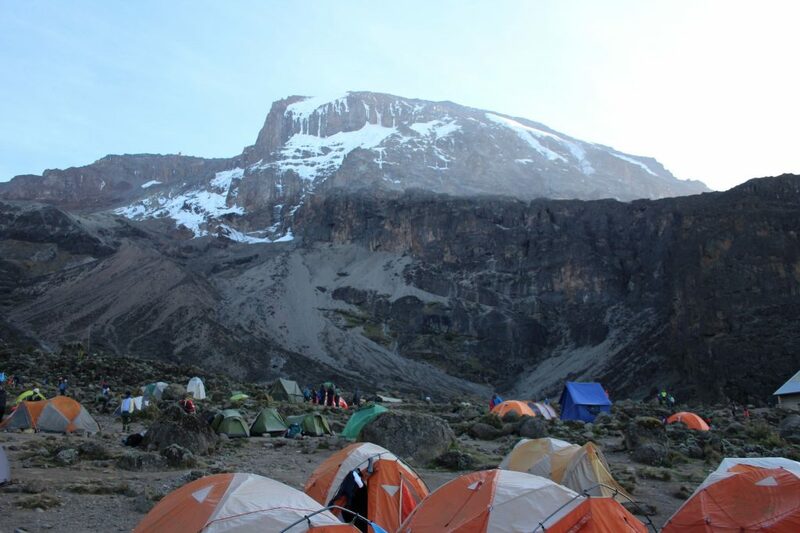 The rest of the day was a steady down, a steady up and down and then one last steep scramble up to the camp. 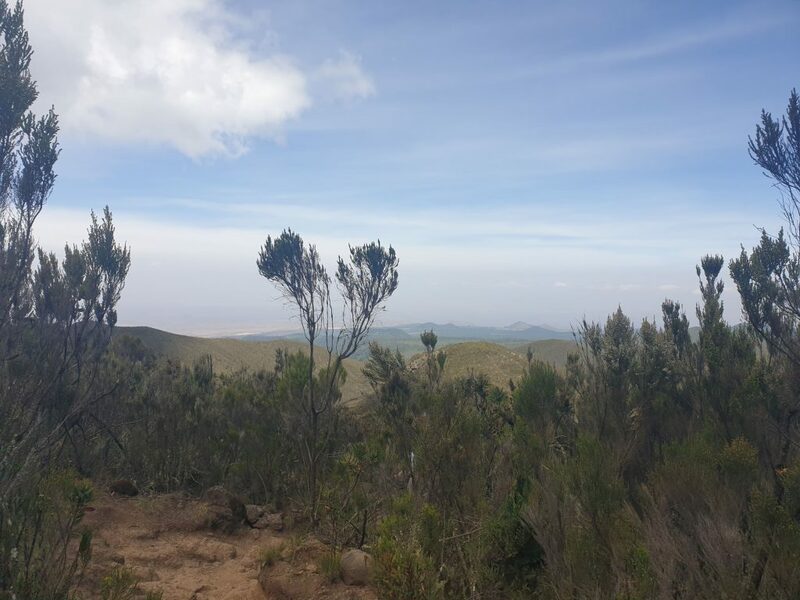 In general, I was coping with the altitude, but the days climbing had caused by back to get tight and that niggled me through the rest of the trip. This was an extremely short day, under 3 hours, as we made our way to the highest camp of the trip. We started out at nine and made camp before noon. Today was all about resting and sleeping, for tonight we were heading to the summit. Over lunch, and again over dinner, we discussed the organisation for the final climb, the kit needed and the timings. The plan was to have dinner around 1830 and then “breakfast” for 2330, with the intent to start the climb before 0100 on Friday morning. 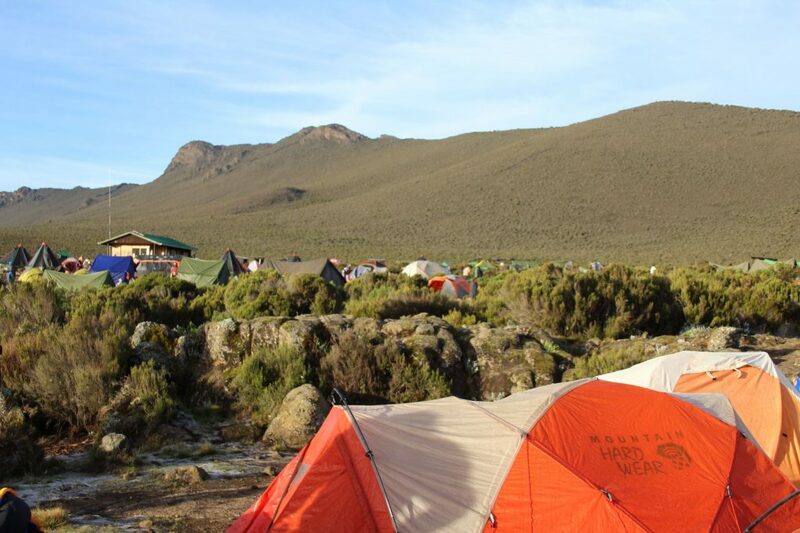 Barafu camp definitely felt the largest, the tents are spread out over a large area. There’s a higher camp (Kosovo) but most people appear to stop here. All you could do today was pack your things and then rest. There was a lot of repacking!! I managed to get some sleep in both sessions, which felt good. A wake up call at 11:30, breakfast at midnight and then we were ready to go.